The global graphene-enhanced composites market is expected to grow at a CAGR of 28.3% and 30.6% between 2018 and 2023 in terms of value and volume, respectively. Graphene-enhanced composites have enabled a myriad of applications from lightweight products to high capacity batteries and stronger materials. Graphene is the major driving force leading to the development of graphene-enhanced composites. The technological advancement for the mass production of graphene has positively impacted the growth of the graphene-enhanced composites. The combination of graphene with various matrices is so attractive that it not only reinforces the matrix but also introduces new mechanical and electronic properties to the material. Graphene is frequently reinforced with polymers such as thermoplastics and epoxies, among others. Graphene-enhanced polymer composites, graphene-enhanced metal composites, and graphene-enhanced ceramic composites are some of the graphene-enhanced composites widely used across various end user applications. Graphene oxide and graphene nanoplatelets are the two forms of graphene being used to produce composites. Graphene-enhanced polymer composites are most widely used across various applications as polymers facilitates easy fabrication process with graphene in comparison to the other types. Along with this, polymer requires graphene in low amounts as compared to metals and ceramic. Haydale, XG Sciences, Inc., and Vorbeck Materials are some of the graphene-enhanced polymer composites manufacturers in the global graphene-enhanced composites market. The report is a compilation of the different segments of the global graphene-enhanced composites market, including market breakdown by composite type, graphene type, application, and geographical areas. Herein the revenue generated from the composite type (graphene-enhanced polymer composite, graphene-enhanced ceramic composite, graphene-enhanced metal composite), graphene type (graphene oxide and graphene nanoplatelet), application (automotive, aerospace & defense, consumer electronics, building & construction, sports & leisure, and others),and geographies (North America, Europe, Asia-Pacific, Middle East and Africa, and South America) are tracked to calculate the overall market size, both in terms of value ($million) and volume (tons). While highlighting the key driving and restraining forces for this market, the report also provides a detailed summary of the global graphene-enhanced composites market. It also includes the key participants involved in the industry at the relevant sections. • What was the size in terms of value ($million) and volume (tons) of the graphene-enhanced composites market in 2017, and what will be the growth rate during the forecast period 2018-2023? • What will be the market size of different types of composites (by value and volume) and their growth rate during the forecast period 2018-2023? • What will be the market size of different graphene types in the graphene-enhanced composites market (by value and volume) and their growth rate during the forecast period 2018-2023? • What will be the market size of different applications of graphene-enhanced composites market (by value and volume) and their growth rate during the forecast period 2018-2023? • What will be the market size for different regions and countries in terms of value and volume in the graphene-enhanced composites market and their growth rate in the forecast period 2018-2023? • What are the major driving forces that tend to increase the demand for graphene-enhanced composites in various end user industries during the forecast period? • What are the major challenges inhibiting the growth of the global graphene-enhanced composites market? • What are the competitive strengths of key players in the global graphene-enhanced composites by analyzing through market share analysis? The report further includes a thorough analysis of the impact of the Porter’s Five Forces to understand the overall attractiveness of the industry. The most commonly used strategy for developing a better hold on the market has been through partnerships, collaborations, and joint ventures. Moreover, the company profile section highlights significant information about the key companies involved along with their financial positions, key strategies, and developmental activities of recent years. Further, the report includes an exhaustive analysis of the geographical split into North America, Europe, Asia-Pacific (APAC), Middle East & Africa, and South America. Each geography details the individual push and pull forces in addition to the key players from that region. 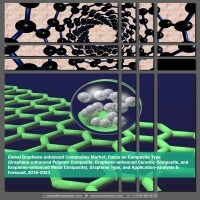 This report is a meticulous compilation of research on more than 100 players in the global graphene-enhanced composites market and draws upon insights from in-depth interviews with the key opinion leaders of more than 50 leading companies, market participants, and vendors. The report also profiles approximately 16 companies with their financial analysis, SWOT, and product portfolio. The company profiles in the report are Applied Graphene Materials plc, Global Graphene Group, Graphene 3D Lab Inc., Graphene Composites Ltd., Graphene NanoChem Plc, Graphenano, Haydale Graphene Industries Plc, Merck KGaA, NanoXplore Inc., SHD Composite Materials Ltd, The Sixth Element (Changzhou) Materials Technology Co., Ltd., Thomas Swan & Co. Ltd., Versarien Plc, Vorbeck Materials Corporation, and XG Sciences, Inc.
7.4 Graphene 3D Lab Inc.
7.12 The Sixth Element (Changzhou) Materials Technology Co., Ltd.
7.13 Thomas Swan & Co. Ltd.
Graphene, referred as a wonder material, possesses an unparalleled combination of electrical, thermal, and optical properties. It is single atom thick but is stronger than steel and tougher than diamond. These qualities of graphene have enabled a myriad of applications from lightweight products to high capacity batteries and stronger materials. Graphene was invented way back in 2004 and, since then, many academic and commercial groups have begun researching on the potential application of the material across various end users. The most notable property of graphene-enhanced composites is their fracture toughness which makes them an important material for engineering applications. The combination of graphene with various matrices is so strong that it not only reinforces the matrix but also introduces new mechanical and electronic properties to the material. Graphene is frequently reinforced with polymers such as thermoplastics and epoxies, among others. Graphene-enhanced composites have started to mark their presence in the commercial market. However, the growth has been rather slow. Over the years, it has been observed that any new material takes years of research and development to attain the mainstream adoption. There are challenges with the mass production of graphene which are acting as hindrance for the growth of the market. Graphene-enhanced composites are expected to be fully commercialized in the next five years, provided a mass production method is devised by the key players operating in the market. Graphene-enhanced polymer composite, metal composite, and ceramic composite are some of the graphene-enhanced composites widely used in the end user industries. As a consequence of the extensive application of graphene-enhanced polymer composites across various domains and verticals, such as aerospace & defense and automotive, among others, it is the most commonly used composites in the graphene-enhanced composites market. The growth of the segment can also be attributed to its easy fabrication process as compared to its counterparts. In terms of value, the global graphene-enhanced composites market is expected to grow at a CAGR of 28.3% during the forecast period 2018-2023. Some of the factors driving the growth of the global market for graphene-enhanced composites include the rising demand for lightweight materials, government regulations to curb the carbon emissions, and increasing research and development by the key players operating in the market. There is a growing demand from end user, such as automotive, for lightweight materials and for use in batteries and other components of heavier electric vehicles. Graphene-enhanced composites market growth is backed by funding from government of various countries. For example, in 2013, the European Commission launched a Graphene Flagship program which was aimed at addressing big scientific and technological challenges through research efforts. Similar steps have been taken by governments of various countries including the U.S., Japan, China, and South Korea, among others. These initiatives are mainly aimed at building awareness about this ‘wonder material’ and facilitate the collaborations across various stakeholders in the industry. Along with this, tech companies are also investing in research and development to develop the understanding of materials. For instance, Samsung has already applied for many graphene-related patents. Additionally, several universities are also steering ahead the research process pertaining to graphene. In 2017, the aerospace & defense segment dominated the global graphene-enhanced composites market. The aerospace & defense segment is effectively exploiting the graphene-enhanced composites for both the civilian and military aircrafts. The use of graphene-enhanced composites in aircrafts has led to an improved aircraft efficiency, lower consumption of fuel, and the development of aircrafts with lower carbon emissions. Along with this, graphene-enhanced composites are used to manufacture smart aero structures which absorb less moisture and are damage resistant. Graphene is used in the form of either graphene oxide or graphene nanoplatelet for the production of graphene-enhanced composites. In 2017, graphene-enhanced polymer composites dominated the global graphene-enhanced composites market with a market share of 90.4% in terms of volume. Graphene-enhanced polymer composites are multiphase materials consisting of a polymer having graphene dispersed in the polymer matrix which significantly affect its physical properties. Graphene-enhanced polymer composites are known to have high thermal conductivity. Polymers have many advantages such as low cost, lightweight, and good corrosion resistance, which makes them an ideal material to be fabricated with graphene. In 2017, Europe accounted for the largest market revenue share in the global graphene-enhanced composites market. Being one of the largest graphene material manufacturer and supplier, Europe is home to a state-of-the-art process of innovation in the field of graphene-enhanced composites. The governments of various countries in the Europe region are highly supportive of the potential steps taken by the key players toward advancement in the field of graphene-enhanced composites. The government has been funding a lot of research initiatives for the commercialization of graphene. Apart from the government funding, key players in the Europe region are also increasing their R&D investment to promote an early commercialization of graphene-based products. In 2017, the U.K., followed by Germany, generates the highest revenue in the region.